I have Vine Servers running on two machines on my LAN, a Mac Mini and a MacBook Pro. Ever since installing Leopard, I've noticed that despite explicitly disabling Rendezvous in the configuration for the system server, I'm still seeing it show up in the "Shared" places section on reboot, and Bonjour Browser confirms this. What is strange is this ONLY occurs on the MacBook Pro, not the Mac Mini. 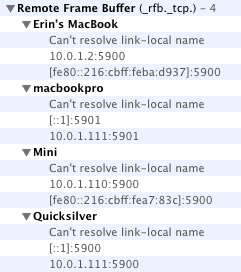 I've verified the only line that differs in the config file is the screen name (mini vs macbookpro - imaginative! ), and the server binaries also do not differ. I have run various versions of VineServer for years on the MacBook Pro (and previously on an iBook before I migrated); is there some old configuration file somewhere that could be causing this? I'm rather at a loss. Apple's ARD / Screen Sharing in Leopard also advertises using that same Bonjour tag, make sure that you have that disabled. That is what is showing up as Quicksilver. Vine Server is using a different port and display name (macbookpro). I have this same configuration on both my Mac Mini and my MacBook Pro, yet this oddness is only showing up on the MacBook Pro. Sorry about that but thanks for posting so we can get it fixed up.